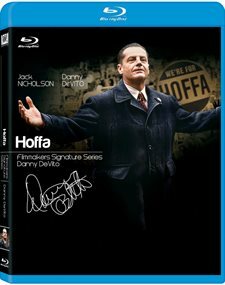 Download Hoffa in Digital HD from the iTunes store. Hoffa images are © 20th Century Fox. All Rights Reserved. Jimmy Hoffa; anyone who knows a little about unions, truckers or the formation of the Teamsters is familiar with his name. In 1992 Danny DeVito attempted to weave a story of the often misunderstood man. Jack Nicholson plays the Detroit street fighter who rose from the ranks of trucker and labor organizer to build the Teamsters into the nation's most powerful union. The boldness of director Danny DeVito's violent epic is matched by Nicholson's astonishing physical and vocal transformation into Jimmy Hoffa. The changeover might constrict another actor. Not Nicholson. And not writer David Mamet, who lays out a sympathetic portrait of the blue-collar fighter whom most people dismiss as a Mob tool. Hoffa went to jail for jury tampering and mail fraud in 1967, ran the union from his cell until 1971 (Nixon commuted his sentence on the condition that he step down) and then battled to regain his position. On July 30th, 1975, Hoffa disappeared, presumably the victim of the Mob, which couldn't control him. Though Mamet doesn't deny Hoffa's ruthlessness or friendships with racketeers (Armand Assante plays a representative composite), he gives equal weight to his bargaining and leadership skills. It's a balance supported by Arthur A. Sloane's well-regarded 1991 biography. But Mamet and DeVito go further, stretching points and inventing characters to create a stinging, black-comic vision of how business gets done. Hoffa had it backward. Most bosses hide their thug hearts under a show of dedication. Tough guy Hoffa actually cares about the working stiffs. 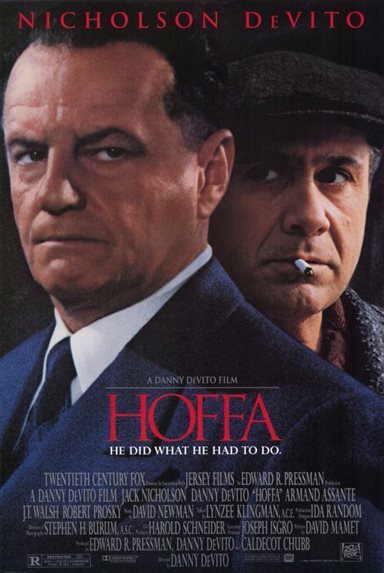 The movie presents Hoffa from the viewpoint of his beloved rank and file, epitomized by the fictional Bobby Ciaro (DeVito plays the role), a trucker who becomes Hoffa's aide and friend. Ciaro is a deck-stacking device. But there's nothing questionable about the way Nicholson investigates Hoffa's contradictory nature as family man and warrior. At home with his wife, Josephine (Natalija Nogulich), the frugal, abstemious Hoffa is warmly affectionate. On the job — handling strike breakers or arch foes such as Robert Kennedy (a vigorous turn from Kevin Anderson) — he's a sledgehammer. In both cases he's protecting what's his. 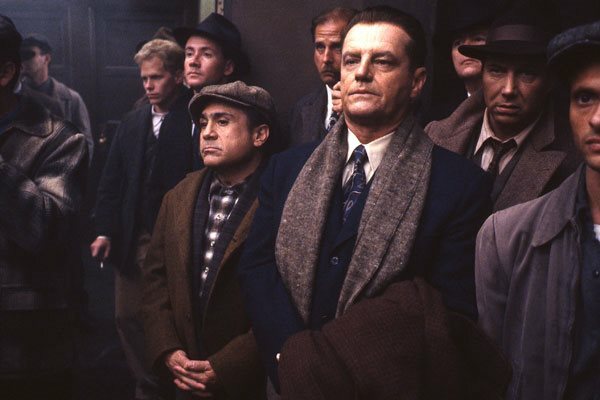 DeVito and cinematographer Stephen H. Burum provide a huge canvas over which Hoffa marches like a champion of the worker. Like all myths, Hoffa will be cheered and derided. But the movie is more than a corrective to Hoffa's tarnished image. It's a stirring. provocative exposé of the uses and abuses of power. Perhaps the extent of Hoffa's impact will never be known. But in the still, watchful center of Nicholson's volcanic performance, you'll find the measure of the man. On Blu-ray you'll be equally impressed with the look and sound of the film. Seeing Nicholson rendered through Blu-ray on emphasizes the incredible transformation he went under to become this figure. Packed with the film are a number of special features starting with a commentary from DeVito himself. DeVtio also lends his thoughts to the musical score along with composer David Newman. Another interview with DeVito as he speaks at the 2011 Teamsters Convention. Also there are some deleted scenes, historical news footage, some comments from Teamster Members, a script read-through, production gallery and more. Clearly this was a passion project for DeVito given how he appeared at the convention in Las Vegas. Casting Nicholson as the title character makes complete sense as you watch the movie. Only Jack could bring to life the often misunderstood man on the big screen. These two men on this film make for a powerful union (no pun intended) and re-watching it now after all these years it has lost none of its power. Hoffa images © 20th Century Fox. All Rights Reserved.